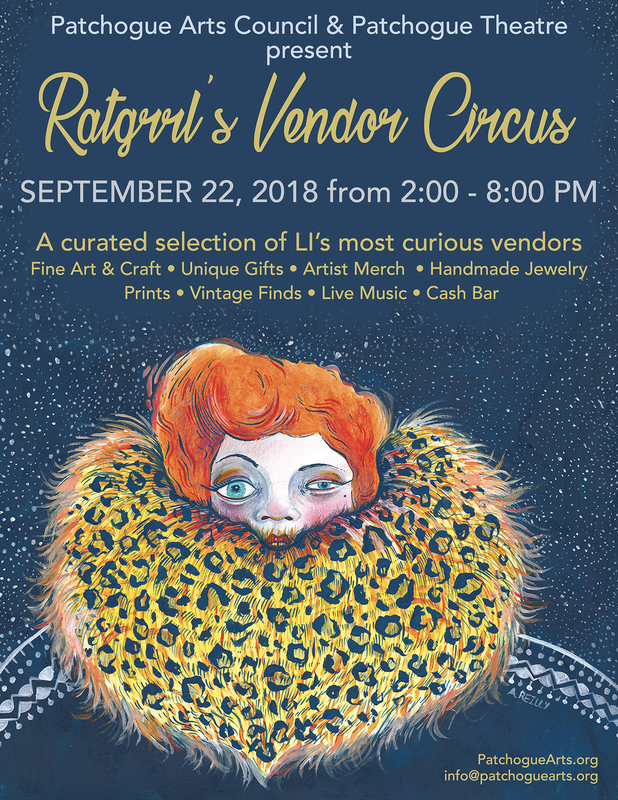 Event: Ratgrrl’s Vendor Circus - Artist's Works for Sale | Patchogue Arts Council, Inc.
Patchogue Arts Council and Patchogue Theatre for the Performing Arts come together to present a curated arts vendor event like no other taking over the entire Patchogue Theatre! Long Island’s most curious vendors will set up for this unique event throughout the entire theatre from the lobby to backstage! With room for 40+ vendors, guests will find illustrators, printmakers, painters, handmade jewelry, artisan foods, artist merch, pottery, sculpture, vintage wares, wearables, curiosities, and more. The event will include live music, live painting, and a cash bar, all under the roof of the beautiful historic Patchogue Theatre in downtown Patchogue Village! Shop for one-of a kind gifts and get an early start on all your holiday gift needs while finding some treats for yourself too! Be a part of Ratgrrl‘s Vendor Circus and come vend with us. We are interested in vendors who will also help promote the event on their various social media outlets. We will be highlighting each vendor with a solo post, and you will be included in all press once your vendor space is confirmed. (table and ALL materials needed provided by vendor). If selected a vendor fee of $100 will be due by September 1, 2018. Artist bio and or statement about your works. This will be used for publicity. Submissions must include 3 – 5 jpg images of products to be sold at the event. files should be labeled with the artist’s name and number of image. All vendors will be notified of selection by email only. All vendor fees are due by September 1. Selected vendors will pay a fee of $100 per 6’ space. Cash or checks must be payable to The Patchogue Arts Council, Inc. If a selected vendor fee is not received by September 1, the space may be released to a new vendor at the discretion of PAC. Please note selected vendors will need to supply all necessary materials and supplies for their spaces. This includes a table, table cloth, and all display related materials. Please note there is no wall space available. Vendors are welcome to bring an easel to set up behind their allotted spaces. No easels or displays can exceed the table width. Selected vendors must be available to set up their spaces between 10-12:00 NOON on September 22, 2018. Please email info@patchoguearts.org for any other questions.